Line the swiss roll tin with greased non-stick baking paper. Whisk the egg whites in a large bowl with an electric mixer on full speed until very stiff. Lower the temperature to 160°C and bake for a further 15 minutes until crisp and firm to the touch. Make meringue buttercream and add pink food colouring. Spread evenly over the cooled meringue. Roll up the meringue firmly, using the paper to help you, from the long edge of the roulade. Ensure the the roll is kept very tight. Wrap in non-stick baking paper and chill before decorating. 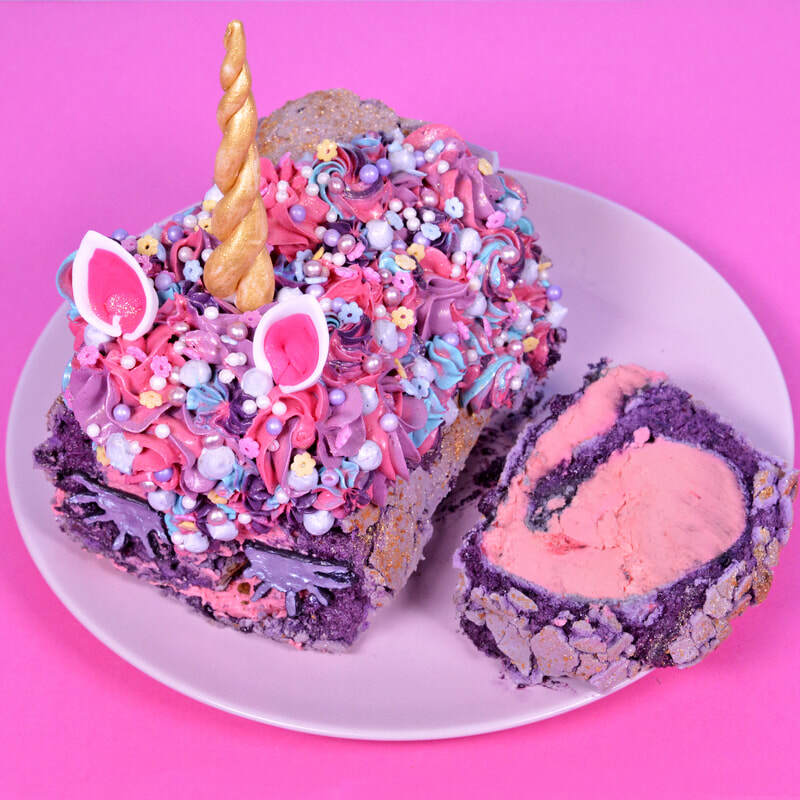 Use white fondant to create a twisted unicorn horn shape. Decorate with gold lustre. To make the ears, cut into a petal shape and fold the bottom together. Do the same with pink fondant (or add pink food colouring to white fondant) to make the smaller inner ears. To make the eyes, create the shape of the lashes using black fondant, or colour white fondant black using black food colouring. Finish with silver lustre. Divide the meringue buttercream into three, and colour each with a different colour(pink, blue and purple). To create the mane, pipe alternate colours onto the top and side of the meringue. Place the fondant unicorn horn and ears onto sticks and add to the mane. Add gold lustre to the roulade.